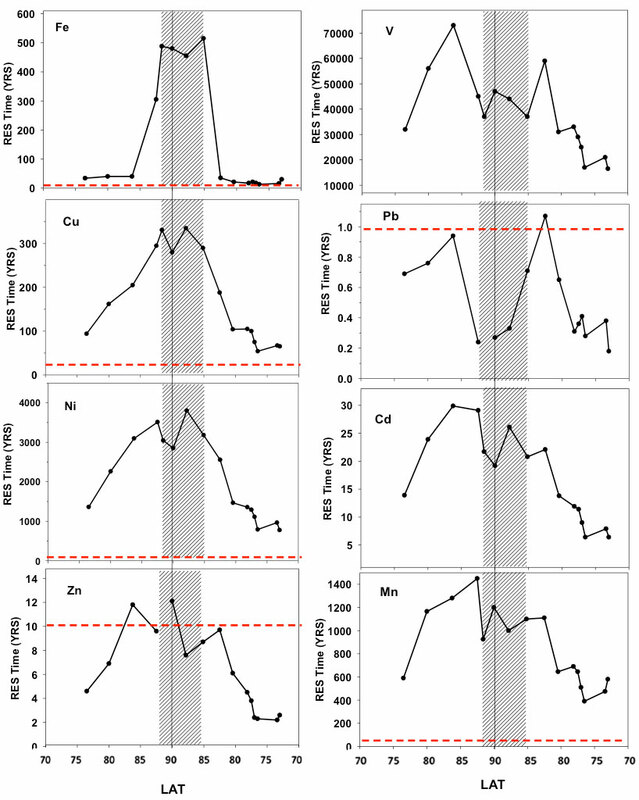 Data collected during the US Arctic GEOTRACES expedition in 2015 (along GEOTRACES section GN01) were used to estimate the mean residence time of dissolved trace elements (iron-Fe, manganese-Mn, nickel-Ni, cadmium-Cd, sinc-Zn, copper-Cu, lead-Pb, vanadium-V) in surface water with respect to atmospheric deposition. The calculations utilized mixed layer trace element (TE) inventories, aerosol solubility determinations, and estimates of the atmospheric trace element flux into the upper ocean. The later was estimated by the product of the beryllium-7 (7Be) flux (determined by the ocean 7Be inventory) and the TE/7Be ratio of aerosols. The breadth of measurements afforded by the GEOTRACES program allowed these data to be assembled. The distribution of residence times with respect to atmospheric input across the expedition track informs us of additional sources or sinks for each element. For example, the residence time of dissolved Fe was ~ 20–40 y for most stations. However, several stations that display a longer, oceanographically inconsistent apparent Fe residence time of ~300–500 years are likely influenced by additional input from the Transpolar Drift (TPD), which has been shown to convey shelf water properties to the central Arctic. This was seen for Cu, Ni and Zn as well, but contrastingly V and Pb show a decrease in the apparent residence times within the TPD waters, suggesting removal of these elements from the source region of the TPD. Figure: Left column: Residence time plotted against latitude for elements showing enrichments in the TPD (Fe, Cu, Ni, Zn). Right column: Residence time plotted against latitude for elements showing a deficiency in the TPD (V, Pb) and for Mn and Cd which do not display an apparent relationship with the TPD. The shaded area represents the stations influenced by the TPD. The horizontal red dashed lines indicate residence times from prior literature in other ocean basins. Click here to view the figure larger.